The dust has barely set in Abu Dhabi and there’s already talk of the 2011 season. It’s 16 weeks away; but that’s Formula One for you. This is a sport that lives in the future. But allow me this one discretion and I’ll wrap up the past season for you. The past is reserved for nostalgia and legends. The future is for champions. This can be universally applied to Formula One for the drivers, mechanics, designers and the pit wall. Living in the future is the only way to operate; you always look to the next. The next practice, next qualification, next race, next upgrade, next sponsor, next season. That’s all that matters. When you start living in the present; then the problems mount up, mistakes are made. Let your mind wander back to the stifling heat of Bahrain and reminisce about the season that was. 61st Formula One Season…this was your year. Jenson Button arrived in the Middle East as the reigning World Champion; joining McLaren and Lewis Hamilton on the grid. His winning team, Brawn, had been bought by Mercedes-Benz and had become Mercedes GP…but who was driving for them? Some say he ruined the sport; some say he was the impossible teammate…some say he’s the Stig. A very familiar figure appeared from retirement this year. None other than Michael Schumacher. Would he make it 8 world titles? World Champion at last...but for how long? The first couple of races left us in the situation of not being able to select a front-runner. Although Bahrain was considered a ‘processional’ (little overtaking and generally boring), we saw a hint of a possible return to form from Ferrari with Alonso and Massa taking the top 2 spots respectively. 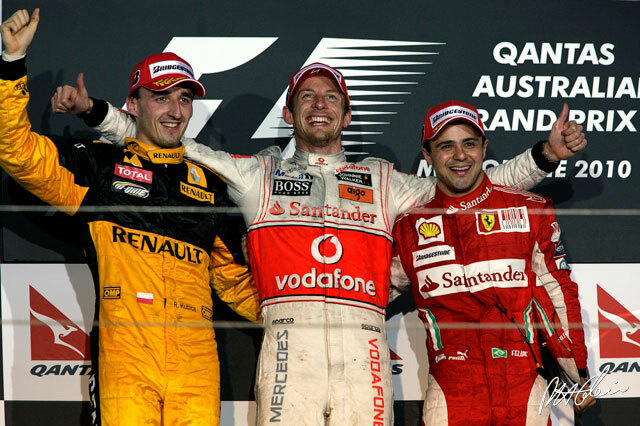 Button won in Australia last year and he continued his good form by taking it this year too; Robert Kubica from Renault took an impressive 2nd bumping Alonso off the podium (10 drivers failed to make it to the checkered flag). And Malaysia saw a glimpse of brilliance from Red Bull with a solid 1-2 from Vettel and Webber; causing McLaren and Ferrari PR to go into meltdown. Three races in and we were none the wiser as to who could take the title this year. Early bets were with McLaren and they made their intentions clear in Shanghai where Hamilton and Button took the 1-2 for their team. It was looking good, great even for them. Button used using his win from 2009 to his advantage and made the most of an excellent car; Hamilton, it seemed, was forming another title bid. 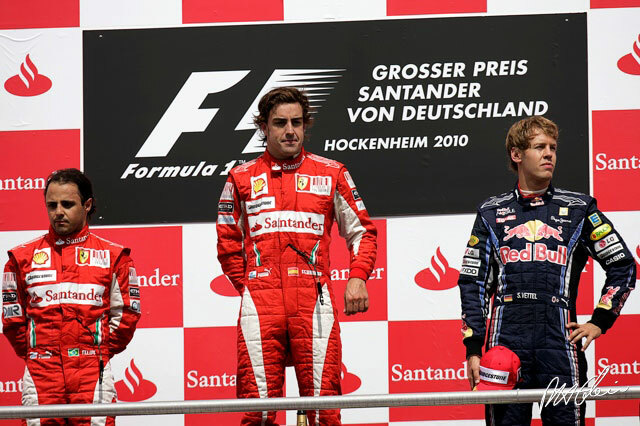 They were joined on the podium with a respectable 3rd place from Schumacher teammate, Nico Rosberg. On the home asphalt of Fernando Alonso there was an air of inevitability regardless of the poor form of the Ferrari’s of late. Alonso was expected to perform, and he almost got that 1st place cap on his head. But Webber out galloped the prancing horse with 24 seconds to spare. He followed this up with another win in Monaco. Winding around the designer boutiques and marina views wasn’t what the press wanted to report; instead the Red Bull celebrations of their 1-2 win dominated headlines. The blue ribbon race ended with both drivers leaping into the marina fully clothed. Turkey saw Hamilton and Button reign supreme; with stunning pace in the latter parts they were able to capitalise on the Red Bull mistake. Webber and Vettel collided on lap 40 after an attempted overtake. Hamilton then matched Webber’s back to back victories in Canada. 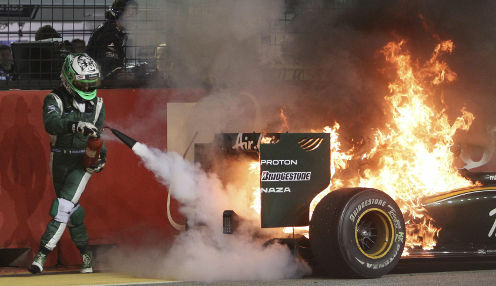 In Valencia we saw Webber flip his car in spectacular fashion after slipstreaming Heikki Kovalainen. 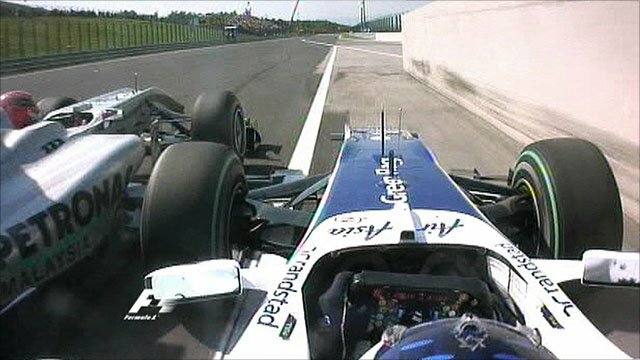 After clipping Kovalainen’s tire at the fastest section of the course Webber plunged into the wall. We feared the worst; but he walked away nothing to show for it. Yes; he walked. Talk about Aussie Grit. “Not bad for a number 2 driver…” Those words were filled with venom after Mark Webber won at Silverstone. 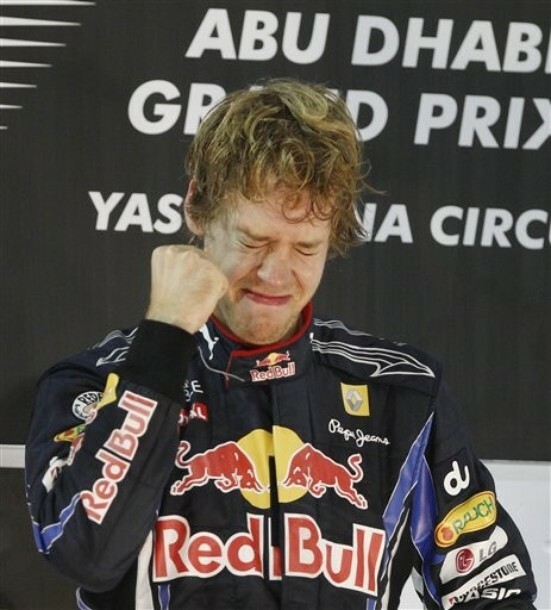 He lost his Silverstone-spec front end after Vettel damaged his…thus beginning the Red Bull civil-war. Rosberg outshone his teammate again with a stunning 3rd position; showing that experience isn’t everything. We had thought that internal tug-of-war within Red Bull would define the season…but that title had to go to Ferrari. Alonso declared himself the next World Champion in Silverstone; and he meant it, even if it required a little help from the team. Germany divided the fans; the teams and the press. Massa's face says it all. “OK, so, Fernando is faster than you. Can you confirm you understood that message?” The desperately sad words of Felipe Massa’s race engineer Rob Smedley crackled through the radio. The whole world knew what he meant; it was an insult to call it coded. Standing on that podium we saw a broken Massa; downcast and relegated to the supporting role. Ferrari weren’t the only ones having a hard time; Hispania were about to start the merry-go-round of driver line-up changes that hindered their end of season performance. 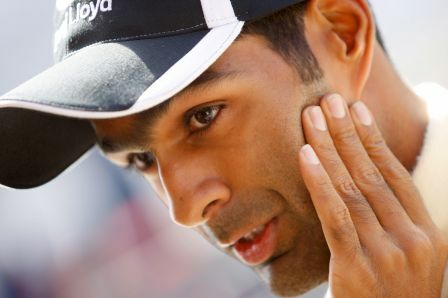 Karun Chandhok’s two P14 races helped them off the bottom of the table; leaving them sandwiched between the other rookie teams, Lotus above and Virgin below. Will Chandhok have a seat next year? 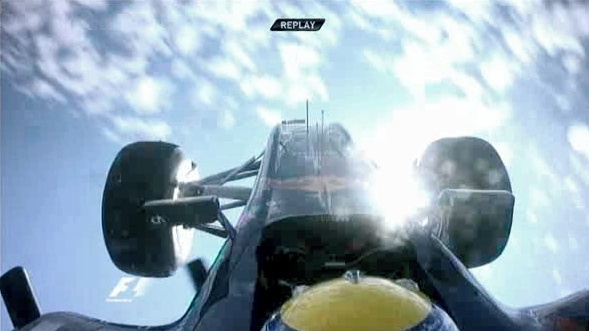 Webber won again in Hungary; Alonso 2nd, Vettel managed 3rd after breaking a safety car rule. Schumacher pretended he was driving for Ferrari and subjected Barrichello to a terrifying moment; almost forcing the Brazilian into the wall. Hamilton surfaced again in the rain at Belgium; McLaren showing their ability in the wet races. Kubica impressed here to take 3rd behind Webber. Vettel made a couple of mistakes; another drive-through penalty caused by the safety car coming out, then he ploughed into Button taking the Brit out. A mistake by Alonso saw him finish early; but he regained composure by winning the team home race in Italy. This took him to an impressive 3rd victory in a season where he had made uncharacteristic errors and suffer reliability issues. Schumacher (left) 'defends' his position. And boy did he march on then. Alonso took his 4th victory in Singapore and made it all the sweeter by claiming his first Grand Slam (qualify in pole, lead the whole race and score the fastest lap). It looked like his prediction in Silverstone was coming true. Onto Japan and Red Bull were quick to remind Ferrari that they had the faster car and scored another 1-2; someone should have trademarked that…would have made a fortune this year! Lotus fielded their best result here with Kovalainen achieving P12. The Korean Grand Prix was a contentious issue for everyone. 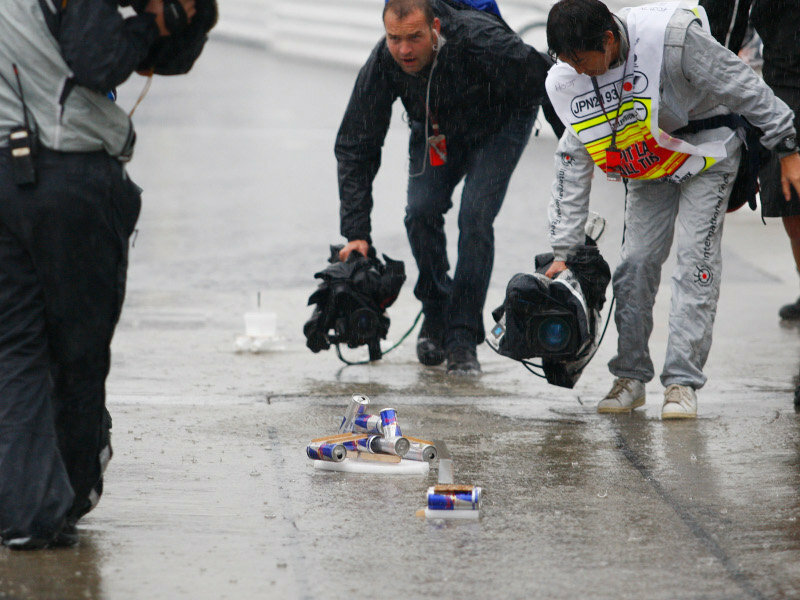 The track was still waiting for the final layer of asphalt when the cars were charging around Suzuka. Ecclestone issued a stern warning and miraculously the circuit was ready for a final inspection. Everyone apart from Lewis Hamilton wanted the race cancelled; and if Red Bull had Alonso’s crystal ball they would have started chipping the top layer off. Webber spun out on lap 19 and Vettel’s engine threw up with 10 laps remaining. A double DNF gifted Alonso his 5th win. The only race Red Bull finished this weekend. Post downpour we were ready to samba; Brazil was next destination and Interlagos was the target. The drivers put on their dancing shoes and we had 5 contenders in reach of the title. Although, Button could be considered to be ‘mathematically’ in it; the chances of him winning were, to put it politely, slim. And to compound this fact he was subject to an attempted car jacking; saved by the phenomenal skills of his driver, literally driving through the traffic. Button’s chauffeur almost clinched the driver of the weekend award; but was pipped to the post (along with every other driver this weekend) by The Hulk. Nico Hulkenberg pulled the qualifying lap of the season; beating the others by over a second. But he failed to capitalise and Red Bull won the constructors title with a patented 1-2 (but not without a few choice words from Webber during a press conference). The last race of the year was Abu Dhabi with 4 title contenders left (Hamilton was the outsider); the most in F1 history. All Alonso had to do was to finish 4th and he would have his 3rd title; and with his recent form it seemed like a done deal. It was Alonso’s to lose and with an average qualifying from him and a worse one for Webber; things were looking good upfront for the others. An early pit stop for Webber enticed Ferrari to follow suit; easily the biggest mistake of the season. And for 40 laps they were both stuck behind Vitaly Petrov…yes Petrov. Eyes to the front and Vettel crossed the line first; but was he the champion? 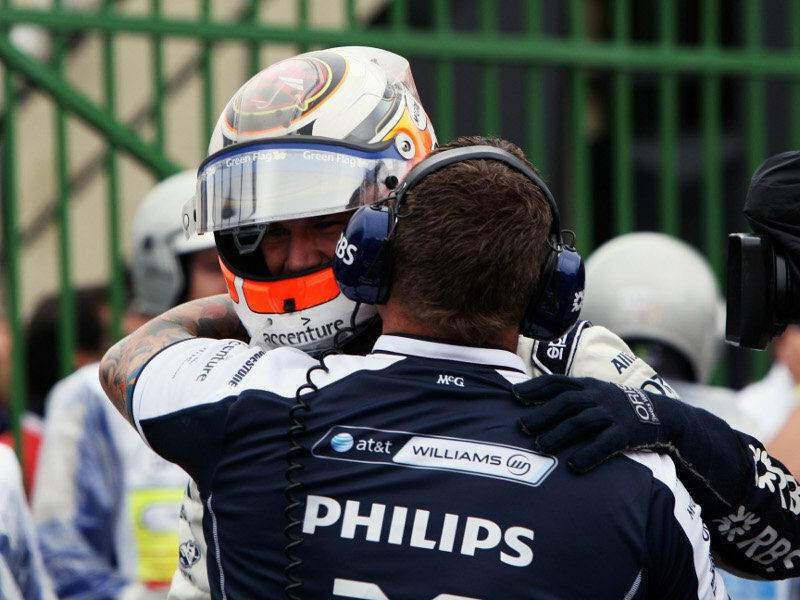 An agonising wait ensued before his race engineer could confirm the only word he wanted to hear. That’s it. Done. Dusted. Wrapped up for another year I feel like I should be wearing black and mourning the loss of my fortnightly entertainment. But no matter; we’re truly into the off season. The young drivers test is over and the first outing on Pirelli tires on the horizon…then we’re into the transfer window. 10. The Return of Schumacher and Lotus. 9. Alonso’s face being mauled by the Ferrari rollercoaster. 8. Proof that you can win without team orders. 7. Kobayashi finding a place to overtake pretty much anywhere. And the comedic timing of him overtaking in the same spot again and again and again in Japan. 5. Robert Kubica all year. 4.“Not bad for a number two driver” – Mark Webber in Silverstone after losing his new front end to teammate Sebastian Vettel. And the subsequent battle that lasted the season. 3. Alonso’s stunning come back in the last half of the year in the 3rd fastest car. Showing unbelievable self-belief and healthy slug of ego can work wonders. 2. This song…8 months of heart stopping action rounded up in 2.5 minutes of sheer perfection. Watch it. Shed a tear. Get ready for 2011. 1. Red Bull winning the double in their 6th season with the phenomenal RB6. This season for me was a vintage to be savoured in the years to come; if things ever go flat, we’ll look back to 2010 and remember the thrills and spills. We felt the heart-soaring highs and soul-crushing lows along with the drivers…every spin made you sick, every pit made you gasp, every win made you smile The best in years and we were rewarded with an awesome win from an awesome winner!